A unique partnership among private landowners, hunt clubs and the S.C. Department of Natural Resources (SCDNR) provided individuals who are severely mobility impaired an opportunity to go deer hunting again this year at some of the most well-managed and exclusive private tracts of land in the Upstate. Mobility impaired hunts, sponsored by SCDNR and hosted by private landowners, are a great opportunity for mobility impaired sportsmen or sportswomen to continue or to get involved once again in an activity such as deer hunting. 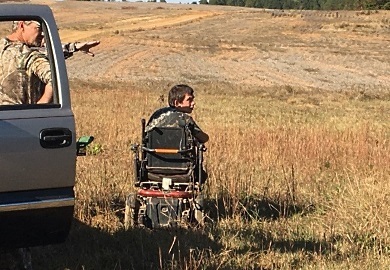 SCDNR handles the publicity, application and notification processes, but the private landowners who host mobility impaired hunters on their property are providing this unique opportunity. There is no application fee or other costs to participate in these hunts. Hunt participants at these events must meet one of three, very specific criteria: Applicants must be (1) permanently confined to a wheelchair, or (2) permanently require some type of mechanical aid (walker, braces, canes, etc.) to assist them in walking or (3) have had a single or double leg amputation. Each participant can bring someone to assist them in a non-hunting capacity and almost all hunting is conducted from ground blinds except in cases where a hunt participant may have a prosthesis and can safely climb a ladder stand. During 2016, two special two-day hunts were held at 53 host sites in Cherokee, Laurens, Newberry, Spartanburg and Union counties. Participating in the hunts were 157 hunters, and they harvested 34 deer (18 bucks and 16 does). All hunt participants, their assistants and hosts met for bluegrass music and an outstanding barbecue lunch for the first hunt at Tyger Ranch in Union County and for the second hunt at the Clinton National Guard Armory in Laurens County. After lunch and prior to everyone dispersing to go hunting, a number of hunt participants won some very nice door prizes that included gift certificates, rifles, shotguns and various other items. The Scott Place (TCA Timberlands) – Otis Taylor The Harry Hampton Memorial Wildlife Fund has been the primary financial sponsor of these events since the first of these hunts in 1995. The Wounded Warrior Project and the Upstate Warrior Solution in Greenville has helped to get a number of severely mobility impaired servicemen injured in combat within Iraq or Afghanistan to attend these special events. Outdoor activities such as hunting can provide immense physical and psychological benefits to injured service people as they transition back into civilian life as well as to other individuals who as a result of an illness or accident are forced to adjust to a new lifestyle that drastically restricts their mobility. "Another very important benefit of these events is the opportunity for the hunt participants to develop friendships and fellowship among others who have similar disabilities and to get together and compare notes on the latest gadgets and specialized equipment that may allow them to better adapt to their mobility impairment," said Gerald Moore, SCDNR wildlife biologist in Union. "It is certainly a great opportunity for mobility impaired sportsmen to continue or to get involved once again in an activity such as deer hunting in spite of their physical limitations. Interested mobility impaired persons are encouraged to apply for these hunts." Applications for the 2017 Upstate hunts will be available in early summer, but you can contact the Union DNR office at anytime to get your name on the mailing list for an application. Information about becoming a host is also available from the Union DNR Office. The office address is Union DNR Office, 124 Wildlife Drive, Union, SC 29379 and the telephone number is (864) 427-5140. An application can also be downloaded in the early summer from the DNR website at www.dnr.sc.gov/hunting/mobilityhunt.